Just in time for the Holidays! 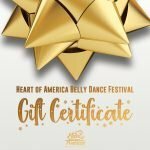 Gift Certificates!!! !